Mysticon Knight Em is contacted by a mysterious spirit who claims to be the original Fifth Mysticon from eons ago. Em trusts the spirit, and convinces the other Mysticons to follow her on a quest through another dimension, uncovering ancient rituals and mysteries of the Mysticons of old. But then they discover a terrible secret about the Fifth Mysticon—one that threatens to tear the current team apart! 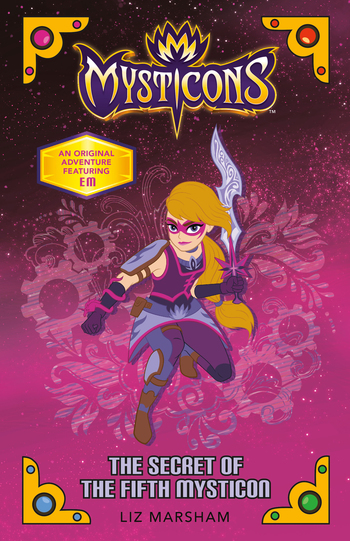 This original novel is based on the hit new show Mysticons, and tells a brand-new adventure for our heroes! Mysticons characters, designs, and elements © 2018 Nelvana Limited. Mysticons is a trademark of Nelvana Limited. All rights reserved. Liz Marsham began her storytelling career as an editor for DC Comics and Disney Publishing. She lives in Los Angeles with her husband, a cat who thinks she is a princess, and a cat who thinks he is a dog. Liz is the author of the Mysticons.